Join us for a fun run to benefit Bridges to Housing Stability as a part of National Hunger and Homeless Awareness Week. We will meet at Charm City Run Columbia at 6:00pm and then head out for 3 miles around Lake Elkhorn. We will be accepting cash donations at the event. Charm City Run Columbia will also donate 10% of sales from 5-8pm that evening. Thank you in advance for helping us make a difference in our local community! Our mission is to provide a path to self-sufficiency to prevent and end homelessness through affordable housing solutions and advocacy in Howard County, Maryland. 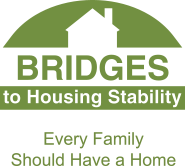 Bridges believes that housing is the key to a household’s stability. Whether resolving the issue of homelessness or preventing a household from becoming homeless, our goal goes beyond crisis intervention – our approach and mission focuses on long term housing stability for our target populations. Let us know to expect you for our giving run by registering below.